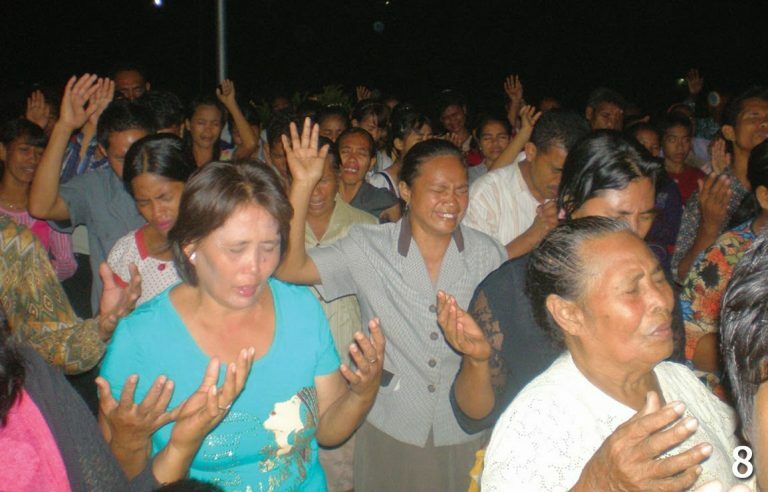 God visited His people in South Halmahera, one of the districts of North Maluku Island. During 2 days, KPPI was held on March 4th-5th, 2011. The work of God took place extraordinarily. Conducted at Ferry Harbor Hall of Sayoang Village, East Bacan, South Halmahera. The Lord was present and visiting His people. Sign and wondres accompanied a two days KPPI crusade in Bacan, beginning with a beautiful rainbow just above the Ferry Sayoang Harbor Hall, and then drizzle that had once poured down, and completely stopped. Even electricity often put out in Sayoang Village, that night during KPPI did not extinguish. Souls came not only from the villages of Sayoang and Babang, but some from Saketa area, which was quite far from Sayoang, from the village of Boro and also from the village of Songa. At around 6.00 PM (Eastern Indonesian Time) the souls began to arrive, and the villagers there, they worked at the fields. The event started at 7.00 PM, and more souls came. When the praises were being raised, the souls came with joyful faces in praising God, those who came from Sayoang Village and Babang Village. As the promotional film of KPPI was being aired, they also seriously paid attention, as well as while they worshiped God, they came earnestly to God. Later on God’s Word was delivered by Rev. Ruben, from Jakarta KPPI team who said that “God loves them so much that God has wonderful plans for them, to save them, to heal them, and to use them as God’s instrument”. On those two nights almost all of the souls that came, accepted Jesus as their Lord and Savior. Praise God when healing prayer, sick souls came forward believing that the Lord Jesus was able to cure their illnesses. They were prayed by God’s servants and counselors. Miracles happened, many were touched and healed by God, from dizziness for half a year and slimy nose produced an unpleasant odor, then there was a lump on the neck cured by God, eye which was difficult to see healed by God, also there was someone who was difficult to walk, God cured. Praise God, He performed His miracles to His beloved people at KPPI in Bacan, Halmahera. God brought about 1000 souls to come to KPPI in Bacan and be saved. Thank God! God visited His people in Bacan, South Halmahera.